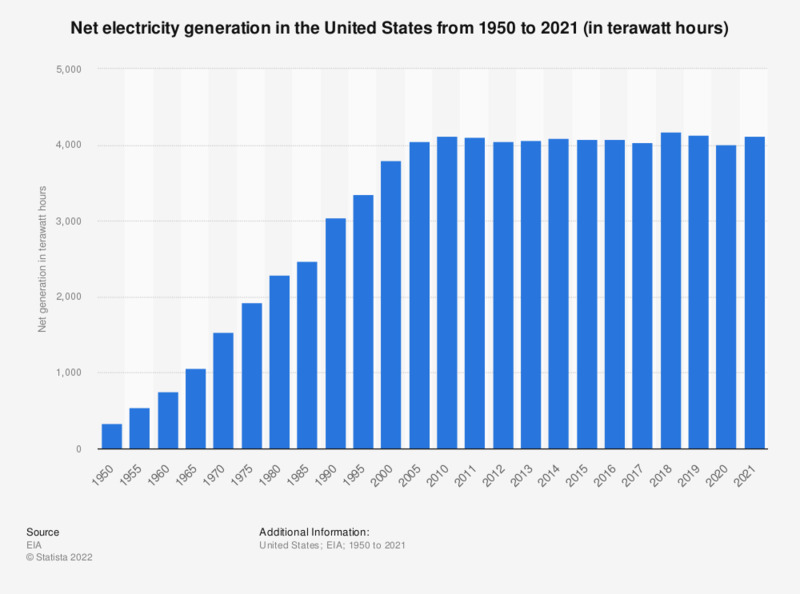 This statistic represents the total electricity net generation in the United States between 1950 and 2017. In 2017, approximately 4.01 trillion kilowatt hours of electricity were generated in the United States. In 2016, the United States generated some four petawatt hours of electricity. Broken down by energy source, this includes about 36.75 billion kilowatt hours from solar energy and 226.49 billion kilowatt hours from wind power. While the bulk of US electricity is produced by investor-owned electric utilities, municipal utilities, federal agencies and utility co-operatives, a growing fraction of electricity – especially from renewable sources – is generated by private homes and businesses. As renewable energy sources such as wind and solar are gaining in importance, large companies including Google and IKEA are starting to accelerate renewable energy installations in order to actually produce more power than they use. Between 2005 and 2015, U.S. renewable energy generation increased from 358 terawatt hours to 550 terawatt hours of electricity. The residential sector was ranked as the largest consumer of electricity in the United States. Retail electricity sales of some 1.41 petawatt hours went to residential users in 2016. Residential consumers are also asked to pay the most for electricity. The average retail price of electricity stood at around 10.28 US dollar cents per kilowatt hour in 2016. Residential users paid the highest prices for electricity while the commercial industry paid about 9.46 U.S. cents per kilowatt hour in comparison. Everything On "Electricity in the United States" in One Document: Edited and Divided into Handy Chapters. Including Detailed References.